Funny thing how an Irish event can bring out a large mixed crowd in a city famously Italian and still succeed. 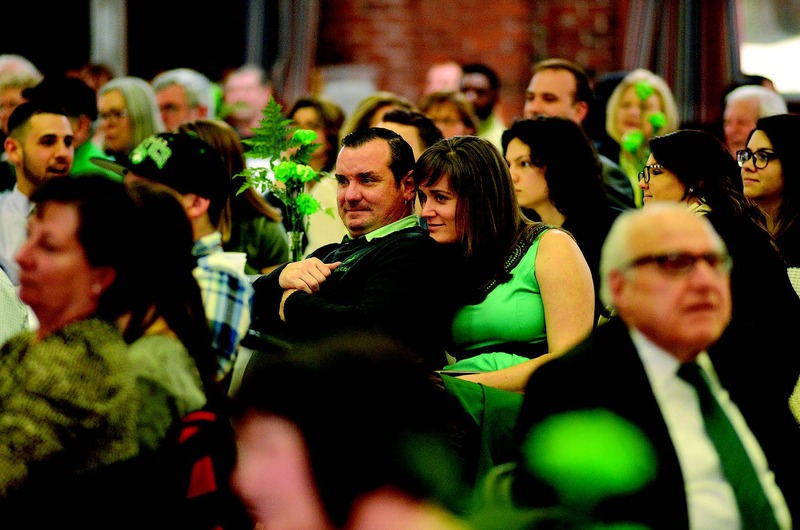 This is exactly what happened at the 64th Everett celebration known as the Friendly Sons of St. Patrick Annual Dinner held at the Connolly Center on Chelsea Street Thursday evening. It was a night for friends to gather together for a few drinks and the traditional corned beef and cabbage dish in a room awash in a sea of green clothing. It was also a night when Bill Perkins, Bill and Brenda Marchant, Frances X. Hogan and Eugene O’Brien were all honored by the Friendly Sons for their extraordinary commitment to Everett and for the great things they have done over the years to make the city a better place. The evening’s honorees Brenda Marchant, Councilor John Leo McKinnon, Gene O’Brien, State Auditor Suzanne M. Bump, Bill Perkins, Bill Marchant and Frances Hogan. Trisha and Sal Sacro, Judith and Ron Farnell, and Dr. Dennis Leonard enjoy the Friendly Sons of St. Patrick Dinner. EHS Culinary Arts student Steven Pinto. Master of Ceremonies Mike Matarazzo. Honoree and Everett City Councilor John Leo McKinnon. Honoree Eugene O’Brien, the director of the Everett Public Schools Music Department. Katherine Drozdick, 12, and Stephanie Hogan, 16, were excited to bid on raffle items at the Friendly Friends of St. Patrick 59th Annual Saint Patrick’s dinner at the Edward G. Connolly Center. Also pictured his Everett School Committee member Frank Parker. Honorees Brenda and Bill Marchant. John Kryzovic, City Councilor John Hanlon and his wife, Frances, and Chris Soule Bailey. Marie and Joe Tozzi and WWII veteran Raymond Lepore. Eileen, Brian, and Sandra McGonagle, and Anne Curnane. “I have lived here all my life. I have loved this city all my life. I love Everett,” she told the crowd. The crowd numbering about 300 gave her and the others being honored a hearty round of applause. Many local politicians were inside the Connolly Center including most of the members of the School Committee and the City Council. Senator Sal DiDomenico attended as did the mayor and the Everett representative. Also noted in the crowd were many members of the city’s business community, as well as members of longtime Everett families. Former City Clerk Mike Matarazzo served as the master of ceremonies welcoming everyone as they entered the main room.